The toddler years are a busy, busy time in a child’s mouth. While some children bite into their first birthday with only a single tooth, most sport a full set of twenty primary teeth by the time they turn three. Though these ‘baby’ teeth aren’t ‘for keeps’, they must take a child through next five to ten years of eating; the last of them won’t be replaced by permanent teeth until somewhere between ages twelve and fourteen. And since each tooth is vulnerable to decay from the moment it breaks through the gum, it’s important to make good dental hygiene a priority early on. Professional care. There is general agreement that keeping a toddler’s teeth healthy requires a three-way partnership of child, parent and dentist. There isn’t complete agreement, however, on when the dentist’s involvement becomes necessary. In the U.K. a first formal visit to the dentist is recommended as early as possible and at least once by the time they’re two. The American Academy of pediatric Dentistry (AAPD), however, advise that visit to the dentist begin as soon as his or her first tooth appears or by age one, whichever comes first. To further confuse matters, some pediatric dentist don’t schedule appointments for a child who doesn’t have a dental problem until age two and a half.When you decide to schedule that first dental visit will depend on the condition of your toddlers’ teeth as well as on his or her doctor’s advice, the recommendation of the dentist, and your on judgment. Any signs of abnormality (an open, unaligned, or otherwise ‘bad’ bite, misaligned teeth; dark spots or uneven colouration on the teeth) require a prompt dental evaluation. Early attention to dental problems can prevent not only the premature loss of primary teeth from decay, but mouth irregularities (malocclusions) that many interfere with speech development.When selecting a dentist, keep in mind that a pediatric dentist has had additional training in the treatment of children, is better prepared than a general dentist to deal with their fears, questions and restlessness in the dental chair. A professional cleaning in every six months, once all teeth are in and regular dental visits begin, will help protect gums as well as teeth from the ravages of plaque (which actually starts forming in a baby’s mouth before the teeth arrives). Fluoride treatment will help strengthen tooth enamel. Later on, when the first of the permanent molars are in (around the age of six or seven), the dentist may apply a protective sealant (a thin, clear, or light-coloured plastic coating) to chewing surfaces. This sealant fills in the pits and crevices in the chewing surfaces and prevents the trapping of debris and the colonization by decay-causing bacteria. Sealant should not replace regular brushing and flossing, however. Home care. Good dental health that lasts a lifetime depends on acquiring the habit of daily dental care. So, if you haven’t already dense so, get your toddler into the habit of brushing regularly even morning and evening (and after lunch too, when possible).Select a toothbrush designed for young children (some brands specify on the box the age group the brush is appropriate for), with a small head and soft, rounded bristles. There are many brushes made for little finger that make positioning the brush easier, and many come decorated with favourite cartoon characters. Some models have lights that flash or that play music for two minutes – the amount of time it is recommended that children spend brushing. Whichever kind you use, remember it rinse the toothbrush thoroughly after each use, and keep it in a holder, rather than lying around where it can pick up bacteria. Replace the brush after three months, or sooner if it’s looking worn – and never allow the sharing of toothbrushes, even among family members. Also replace the brush after your child’s been sick so that germs hidden in the bristles won’t cause reinfection.Brush your toddler’s teeth with a gentle back and forth motion across the chewing surfaces; use a circular motion along the sides and the outer gum lies, a back-and-forth motion on inner surfaces, if you can. Lightly brush the gums where teeth haven’t yet erupted, or wipe them with gauze pad, baby finger brush, or flannel. Skip the toothpaste until your toddler is able to rinse and pit out the residue or use an infant/toddler tooth and gum cleanser that is nonabrasive, nonfoaming and fluoride-fee. When your toddler begins to show an interest in brushing encourage him or her. And don’t worry about teaching a particular method of brushing; the dentist can offer instructions in the proper technique later on. 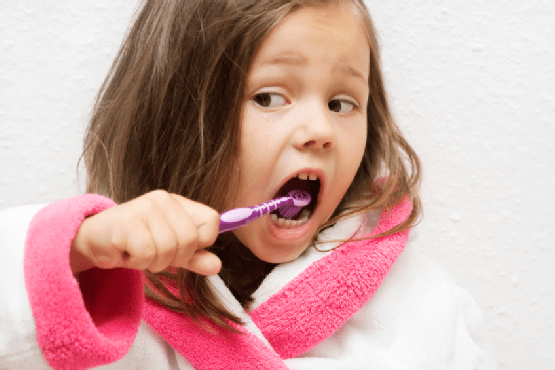 Until your child’s at least seven years old, you should continue to help with the brushing, even if he or she is able to do part of the job solo. Rinsing an essential part of the brushing process. Not only does it remove the toothpaste before it’s swallowed, but it eliminates bits of loosened food that would otherwise just resettle elsewhere on the teeth. Children should be taught to rinse their mouths after brushing as soon as they are able to – usually around age two. Each family member should have his or her own cup for rinsing (use different colours to eliminate confusion and territorial disputes); be sure to wash the cups regularly.When your toddler can rinse and spit, you can begin to put a pea-size amount of fluoridated toothpaste on the brush (so without it or continue using the toddler cleanser if your toddler doesn’t like the taste); but watch out for toothpaste eaters. Teeth-safe diet. Cavities from when bacteria found in healthy mouths (especially Streptococcus mutans) feed on sugars and starches in food residue in the mouth, producing an acid that wears holes in tooth enamel. It’s long been known that foods high in sugar can start this process, but recent researcher has shown that foods high in other carbohydrates (for example, breads and cereals), which break down to sugar in the mouth, can also contribute to cavity formation. Sticky foods, such as biscuits and cakes, containing both sugars and other carbohydrates may do the most damage. Eating cheese, on the other hand, may inhibit cavities and actually strengthen tooth enamel.